Manufacturer of a wide range of products which include aluminum bottles with plastic collar and aluminum bottle with screw plug. We offer Aluminium Bottles With Plastic Collar with industry standard screw necks that are suited for a variety of applications. Available in different size, they have screw neck that is compatible with most spray pumps, lotion pumps and other dispensers. Further, they are available with internal protective coating to prevent the contents from being contaminated. Our valued clients can avail from us a superior range of Aluminum Bottle With Screw Plug in distinct sizes, shapes and capacities. Our team of professionals makes use of quality tested materials and cutting edge technology for the production to ensure their longevity. Our range is dimensionally accurate, finely finished and leakage proof. They find its application in several commercial as well as industrial areas. 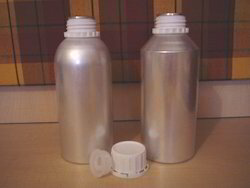 Looking for Aluminum Bottles with Plastic Collar ?